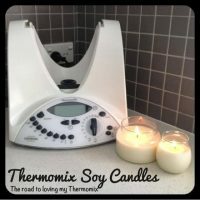 I have spent weeks and weeks researching this topic to create my own recipe. You would think this is quite simple but there is a bit you need to know. Everything is explained below. Before I go on, if you have a favorite brand of powder and are absolutely in love with it, making your own will be a big leap. The consistency is different, the effectiveness (due to lots of chemicals in store bought ones) is different and the smell is different. The store bought ones are a lot more powerful but that is because they use powerful chemicals such as bleach in them. 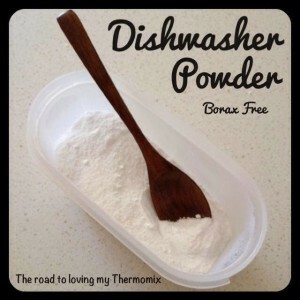 I find this homemade powder works just as well as my store bought tablets for normal loads. For heavier dirtier loads I find the results aren’t as good. I have been experimenting with vinegar as my rinse aid but I’m not finding it very effective so I use store bought rinse aid for the time being until I can find the right homemade version. I think this may be the cause for some loads not being rinsed as thoroughly. Before using the powder for the first time, ensure your dishwasher is thoroughly clean. Ensure all filters are cleaned. With store bought powders they contain heavy chemicals and bleaches which break down sediment and food particles very easily. With homemade powder it isn’t as effective. A clean dishwasher to start with helps. I find giving the dishes a good rinse essential as well. 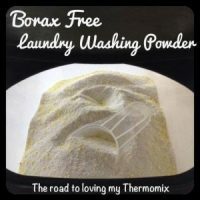 I am still on the fence with Borax after reading what was possibly hundreds of articles and would like to do some more research into it so this is my borax free version of dishwasher powder. 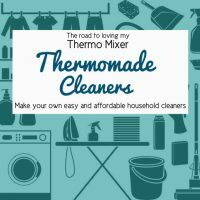 My research tells me that most commercial dishwashing powder and tablets do not contain borax anyway so chances are you aren’t really missing anything by making my version. Also, I learnt that washing soda is two times more effective than borax and bicarb soda being slightly more effective so they are great components to this powder with the absence of borax. My version of powder has a few extra ingredients than a lot of other recipes out there. This means that the price per load is slightly more expensive but my opinion is I’d rather spend that little bit extra for extra cleaning power and get a better result. Total = $3.20 for what I have estimated to be at least 60 loads. That is just $0.05 a load!!! * Each store will vary slightly in price as will each brand. Washing soda: is a water softener and cleans the dishes. Bi carb soda: lifts grime, is a stain remover, deodorises and is a substitute for borax. Salt: salt is added for scrubbing power as well as a natural disinfectant. 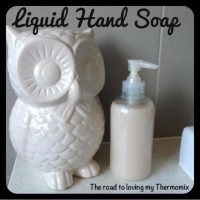 It also helps prevent mould or mildew from forming. Citric acid: cleans, breaks down grease and is a water softener. Its recommended you wear gloves when handling washing soda as it is salt and may cause irritation to those with sensitivities. Remember to put it out of reach of children and pets when finished with it. Use vinegar in your rinse aid compartment for a cheaper alternative to store bought rinse aid. I dont find this as effective personally so will be experimenting a bit with this. If you want to use Borax use it in place of the bi carb soda. Citric acid and washing soda can work against each other so the rule of thumb is 1 cup of washing soda to 1/4 cup of citric acid. Remember this if you start tweaking the recipe. You can use any oil you like. Blitz on speed 6 for 20 seconds. Store in an airtight container with a spoon. You will only need one tablespoon of this powder for a normal wash. Two tablespoons for a dirty load. This may vary depending on how hard your water is and size of machine. You may need to experiment to find what works best for you.